Good morning and a Happy Spring Monday! We’ve just passed our 3-year anniversary and want to say thank you for supporting us and sticking with us as we’ve learned and grown! It’s nice to know that a mission-driven business can survive without compromising it’s integrity. It’s hard work, but good work, and we’ve still got plenty to learn, but we are proud of what we are doing and believe we are offering something very valuable to our community. We appreciate every one of you for supporting our mission! I am teaching a FREE COOKING CLASS at Bauman College (downtown Boulder; Pine and Broadway) on April 13th from 6-7pm. 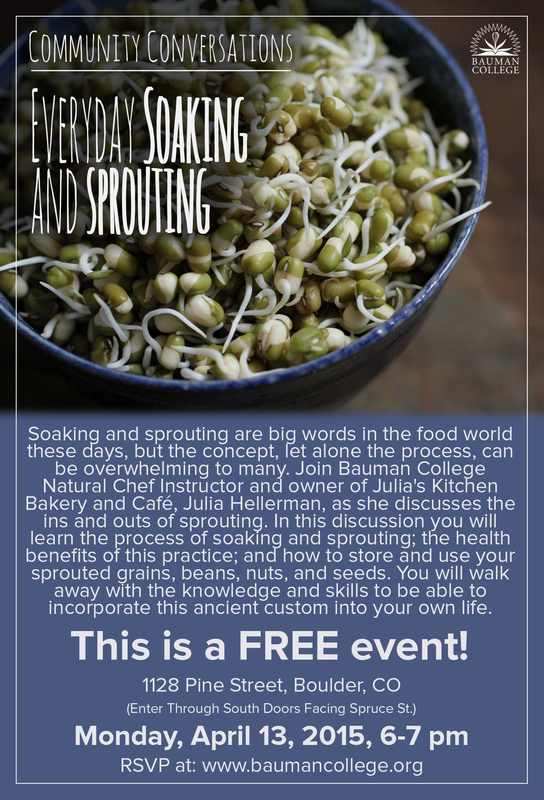 Soaking and sprouting is critical in proper food preparation if you eat any kind of grains, beans, nuts, or seeds and this is a wonderful opportunity to learn about this simple process and how easy it is to incorporate it into your cooking repertoire!